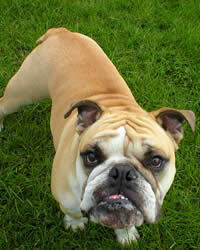 The English Bulldog breed is a medium sized dog with a heavy, thick-set low swung body. They have wide shoulders, sturdy limbs, a massive short-faced head and they are very strong and courageous. The look of their face makes them seem like a very serious kind of a dog, but they are actually a very gentle and affectionate dog. These dogs would have become extinct after the ban had it not been for so many fans. successfully bred to eliminate their ferocity resulting in their docile and friendly personality today. The breed was registered with the AKC in 1934 and currently serves as the national symbol of England. The Bulldog has a very wonderful nature and a very entertaining personality. They make great family dogs, as they love to be with family. Their comical nature always wins everyone’s heart. They can easily be brought up by inexperienced as well as experienced dog owners. This breed does very well with children and other pets, but they do not like it when another animal tries to take their food. They are lazy by nature and won’t be one to constantly running around the house. Living Environment – Because the Bulldog has short hair, they should not be exposed to hot weather. They have a very short muzzle and overexertion can lead to heat stroke and breathing problems. They are not good swimmers and should never be left alone near a pool. Grooming – Proper grooming includes only occasional brushing due to their short hair. They do have a tendency to drool and slobber, so daily face cleaning is a must. Diet & Exercise – Because they are very inactive dogs, they do not need a yard to keep them happy. However, daily walks and short play session are very important to maintain their fitness. Health – This breed has a relatively short lifespan at 8-10 years. Potential health issues include breathing problems, skin infections, hip and knee problems, and conditions of the thyroid and heart. These dogs also have a very low tolerance for anesthesia. As you might imagine, their large head often requires them to be delivered by C-section to avoid getting stuck in the birth canal. Early socialization is a must for this breed, as they can be very stubborn and hardheaded. Dog training should always be done with firmness, consistency, fairness and patience. The Bulldog breed does not respond well to heavy handed methods, so rewards-based, positive dog training is essential as they are trained.